I had a pest guy come and look at our bugs and he told me they were minute pirate bugs? They are little tiny black bugs that are on the outside of our home on our doors and window screens. Usually they are just around in the fall but now we’re seeing them more. I was told it was when the farmers start harvest but this spring they are here and seem to keep getting worse. We live in Iowa by the way. They are worse on the doors during the day and then go away at least on the doors in the evening but are still on the window screens. I also see them in the yard on various plants and I think they can bite! If these are pirate bugs, what do you recommend for treatment and how long do you think it would take for them to be gone or at least get them to where they aren’t as bad and we can actually be outside without them being everywhere? I have a toddler and a dog and I think the dog is allergic to them. Let me know, thank you. Based on how this pest is behaving, I’m sure they’re pirate bugs. And since a local pest control technician believes that’s what they are too, let’s assume this is the target pest. 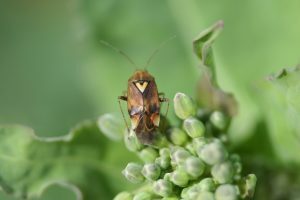 In general the pirate bug is a pest late summer and early fall. They’re predatory by nature feeding on small insects (they love larval stages of crop pests) and when farmers harvest crops many will get relocated from their natural home. Once in the yard, they will hang around untreated plants looking for active food. People and pets in the yard will find them annoying and if you’re allergic to their touch, your skin will welt in a fashion similar to flea or mosquito bites. Now since most insects peak in population by late summer and fall, they can literally run out of food. This causes them to migrate toward more urban, populated areas. It’s here where they encounter man and in many cases, will even sting people so you’re concern is warranted. Now in some years they’ll get active early spring, way before there is any food present, and it appears this is happening right now for you. And when they emerge early, there is usually is no food available. So if there is no food and still some cold in the air, pirate bugs will seek any heated structure to roost and stay protected. This is why you’re seeing them on your home. In the past we’ve seen where many of these early infestations will just “disappear” as the temps rise with spring kicking in. But this might take another month or two. Worth noting is that once pirate bugs start coming around, the structures they target tend to get infested annually over and over so it’s not something you want to let develop if you see it getting worse. And in most cases once they start appearing in the spring you should expect to see them coming around in the fall too. The good news is they’re easy to treat. Just mix up some CYPERMETHRIN and SPREADER STICKER and spray down the siding where you see activity. 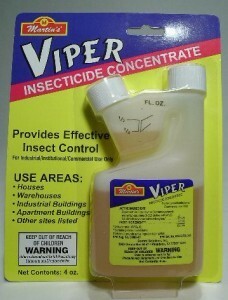 It usually only takes 1-2 treatments to knock them out and the Cypermethrin will repel them for several weeks as well. So if you want them gone now this is what we recommend. And if they come back next fall, be sure to treat then too or else they’ll start using your home for safe keeping during the normally cold winter. And you don’t want that happening because once that starts, some will find their way inside the home for sure. Use 1 oz of Cypermethrin per gallon of water and plan on getting about 500 sq/ft of coverage per mixed gallon. Pirate bugs and other insects will die quickly when you spray and since Cypermethrin is highly repellent, insects will avoid treated areas. 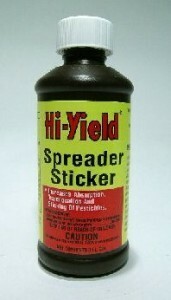 Add Spreader Sticker to the tank mix. This additive allows the cypermethrin to penetrate the thick shell of pirate bugs which protects them well and shields them from the impact of the spray. For gardens where you’re growing vegetables or fruit, use organic MULTIPURPOSE INSECT KILLER. It’s approved for organic gardening so it’s safe to use on any plant that will produce an edible crop. Keep in mind this formulation does not provide any length of residual so that means within a few days of treating, it will effectively be gone. Of course, this is why it’s so good for use on fruit and vegetable bearing plants but the down side is obvious; pests can re-infest easily so be prepared to treat more frequently if you go with the organic option. Treatments can be done with any good PUMP SPRAYER and there is no need to treat the soil so really, there should be no hazard to you or the family when the applications are done properly. 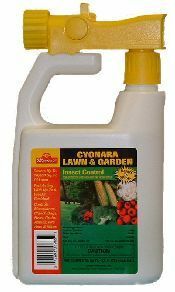 For the grass, shrubs and other ground cover, spray it down with CYONARA RTS. This odorless treatment is actually labeled for vegetables gardens too so it can be used everywhere. It works quickly and can cover large areas. 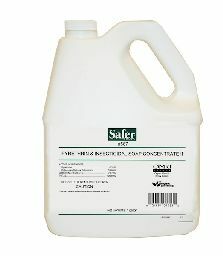 1 quart will cover up to 1/2 acre and treatments will last 2-4 weeks. Renew throughout the season to make sure they don’t come back. Lastly, to keep them off you and the pet, spray down your clothing, skin and fur with BUG OFF INSECT REPELLENT. Minute pirate bugs do not like this active and will stay away from people and pets once treated. It doesn’t take much and will last 6-8 hours so you can go out and enjoy the yard. We are getting the pirate bugs again like we thought since its fall. We had our regular bug guy come and spray last week and the bugs came after that, should we still wait a week to spray the stuff we bought from your company on the house? They really haven’t been horrible until yesterday and the temperature is supposed to drop from the high of 83 today to a high in the 50’s tomorrow and be in that range until at least mid next week. Do you think that will help with them? You had mentioned last time that they could get into our house; my bug guy had said that if they do get into the house they wont survive. I have only noticed a couple here and there in the house probably just coming in when we do. We don’t open the windows obviously since they are around…should we worry about them coming in the house? You definitely need to spray the exterior of the home with some Cypermethrin as soon as you can. Any time pests are allowed to live on a homes exterior, some will invariably end up inside. This is how Stinkbugs, Asian Ladybugs, Asian Roaches and Boxelder Bug problems all start; first they start to accumulate on the outside of the home. And once there, as the nights cool they’ll migrate deep into any crack or crevice they find and that leads them to get into living spaces. So my recommendation is don’t let these pirate bugs have a chance to get inside. And since all you need to do is a simple exterior application every 2-3 weeks when you find activity and that should keep them in check. As for the temps dropping; if anything this will indirectly cause more to come to the home and if the home is not protected, obviously the chances of them getting inside will naturally increase too. I have little black bugs biting me in my car. No doubt there is a wide range of biting insects that can move into a car and nest. Fortunately they’re easy to control with the right products. And with that being said, you’ve got two options that can be employed. The simplest thing to use would be our PT-565. This is a pyrethrin based aerosol can you would manually control. So every evening when you get home and you know you won’t be using the car again until the next morning, you would spray 3-5 seconds of the PT-565 into the cab of the car and let it sit overnight. And if you do this for 1-2 weeks, the problem will be gone. The second option would be to place an Aerosol Machine in the car with some Metered Insecticide. Leaving it in the car overnight would serve the same purpose as the PT-565 but it would be an automated process instead of one you have to do every evening. Now in the morning you will want to turn the machine off and remove it from the car when the car is being used. I live in Green Valley, AZ. I never noticed these bugs before. I have no plants inside or out. When they started biting me, (which is severe painful), I called Terminix. I captured the bugs to show them and they did not know what they were. Thank goodness for your site and spray to kill these nasty nasty bugs!